Read the free introduction here. Written with the Barefoot Doctor, this book promotes mindfulness, happiness and stress-free living. It helps reduce anxiety and stress, build resilience, and helps you reconnect with your zest for life and live life fully on your own terms. Hear a sample (440kb) from A Big Laugh audio CD. The sound of spontaneous genuine group laughter is a natural tonic, anti-depressant, and general mood-enhancer. 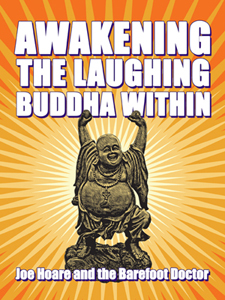 You can use this as a general tonic; in laughter yoga workshops; for a mood lifting experience; for team connection; and many other ways you can think of.